You don’t want to miss I-80 Equipments April Sales Event. 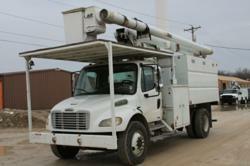 Forestry Trucks, Boom Trucks, and Bucket Trucks are now available at $1,500 off I-80 Equipments already low prices. Today, I-80 Equipment Company, the nation's leading bucket truck reconditioning experts, have announced their April 1st Sales Event. Many forestry bucket trucks, grapple trucks, boom trucks and bucket trucks are now available at $1,500 of I-80 Equipments already low prices. Included in this April Sales Event is free delivery to all 50 states or the closest Canadian border crossing. With I-80 Equipment Company offering 100% financing, you can’t afford to miss this great opportunity for savings. Some of the trucks available during this April Sales Event include an Altec LRV55 - 2005 Freightliner M2 4X2 Forestry truck, a Lightning Loader – 2003 Freightliner FL70 4X2 Grapple Truck, an Altec AC18-70 – 2005 Sterling Acterra 4X2 Boom Truck, and an Elliott ECH-3-70H – 2001 International 4900 4X2 Sign Truck. If you have been looking for a specific brand of truck other brand offerings include Altec, ATC, Elliot, Terex, Prentice, Lightning Loader and EZ Loader trucks. At I-80 Equipment every truck is fully reconditioned and quality inspected to provide their customers with the most consistent value and quality in the industry. I-80 Equipment Company was established in 2006 and has expanded into the nations leading reconditioned truck companies.